Please bear with me, I'm going through a redesign and reconstruction! Back in early (10 - 12) March I got out to Donnelleys' Flats, Tararua Forest Park with Outdoor Training NZ, Manawatu Branch. I was helping out with teaching on a Bronze Duke of Edinburgh Hillary Award outdoor training. Below is my trip report. On the 10th of March, I joined with Outdoor Training NZ, Manawatu Branch to help out with teaching basic bushcraft practical skills for the Bronze Duke of Edinburgh's Hillary Award. I'd only recently mentioned to the chairperson that I was thinking about doing some more bushcraft stuff now that ADNZ Ben and I had gone "solo" and I'd gained some confidence. In usual fashion I jumped on in. The Duke of Edinburgh Hillary Award is a youth development program and one of the components requires students to have an "Adventure". I've been trying to write this blog for over a week. I've started a couple of times and just couldn't form the words on the page. I've found this a hard trip report to write as although I got home safely not accomplishing "Plan A" has been bugging me; it's that "goal achiever" part of me raring it's head. 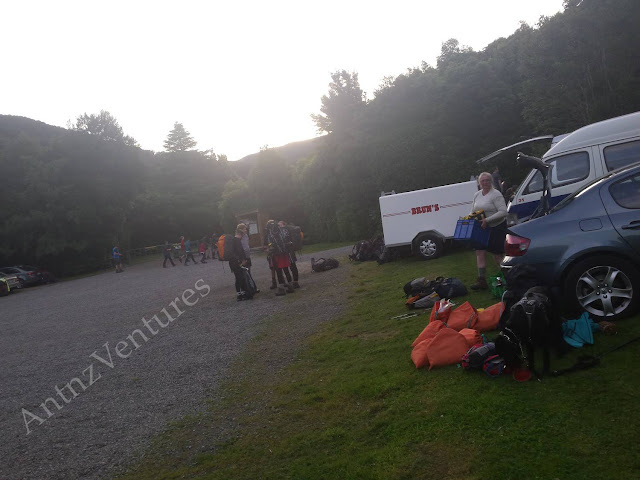 On Monday June 5 I loaded ADNZ Ben, our packs and myself into the car for my partner to drop me off for a 2-3 day hammock camping tramp through Burtton's Track. The track is around 17km, is a dual use mountain bike and walking track and part of Te Araroa. Posted as a 6 hr walk going south (downhill) I was planning on setting up the hammock at around the half-way mark and would see how I was feeling Tuesday. Tuesday morning, depending on how I was feeling; I'd either have a rest & chill out day and head out on Wednesday, or head out Tuesday if I felt up to it.